> Judith Bingham. A Fiftieth Birthday interview with Christopher Thomas. Judith Bingham is that seemingly rare thing in contemporary music. A composer whose music has the ability to connect and communicate with its audience on an immediate and direct level. One needs to look no further than her 1997 Piano Trio "Chapman�s Pool" for evidence. In an age where second performances are often more crucial to composers than the first there can be few recent works to have received over eighty performances in four years, a feat to make many composers (and publishers!) green with envy. The secret of this success can be seen on several levels. A glance through Bingham�s catalogue reveals a considerable struggle to find any piece that does not have a strongly visual or literary theme behind its title, giving the listener an immediate window to access the unique world of each work. The stimuli can be wide ranging, from Errol Flynn to ancient Egypt yet there are certain recurring subjects that continue to provide inspiration, amongst them a fascination for alpine and winter scenery, the sea, mythology and the writing of Shelley. This is not to say that her work is not without it�s darker side. Bingham is not afraid to unsettle her listener where appropriate, with a good number of pieces exhibiting what the composer describes in her own words as a "painful kind of beauty". The music itself, whilst often chromatic with a strictly controlled use of dissonance where it serves the music, does so within a framework that always exhibits structural unity through a strong sense of melodic, harmonic and often rhythmic direction. A clue to Bingham�s practicality as a composer lies in her background as a professional singer, having spent around twelve years as a member of the BBC Singers. It is no surprise therefore that choral music forms a central thread through her entire output, singing having been a part of her life from very early on. "Singing was always there. My father was musical although my upbringing was in a very ordinary lower middle class family, father was a tax inspector and my mother was an auxiliary nurse. My father played the piano and did a certain amount of amateur playing and I was one of these kids that crawled up on the piano but there was always music around. I grew up on the big symphonic repertoire that my father liked, standard stuff, Beethoven, Brahms, Schubert and I had all the records that every child still has, Carnival of the Animals, Sorcerers Apprentice and the like". Composition started relatively early although like many composers memories of the initial attempts are hazy. "I can remember playing a piece that I had written to my father when I was about eight although I think I was writing before that but I never wrote anything down. It was all very secretive though and nobody really gave me any encouragement or help". By her mid-teens singing was becoming a major part of her life and joining the Sheffield Philharmonic Chorus brought an opportunity to experience music making on a new level. "My claim to fame was taking part in Barbirolli�s last Messiah but there were concerts with the Hallé and all sorts of people came in like Barenboim and Antal Dorati. I also started to take an interest in the theatre but there was never any question that music would be my vocation. By this time I was writing quite big pieces, but very much on my own, nobody was taking any interest. I thought of myself as a bit freaky because I did not even know there were women composers. I had no real role models although I adored Berlioz. There was little contemporary music but when I came up to London and went to the academy I remember Maxwell Davies and the Fires of London and that was very influential". Amongst her colleagues at the academy were such luminaries as Felicity Lott, Graham Johnson and Simon Rattle, yet the path was not always easy with little encouragement from her parents and teachers who felt that she should be concentrating her studies on the oboe, "which I played at school and hated". Having works looked at by others for the first time proved difficult. "At first it was pretty disastrous, I was very difficult to deal with and would not accept criticism at all. I had Malcolm Macdonald at first, Eric Fenby for a while and then I went to Alan Bush for about a year and eventually John Hall. Nobody seemed to get the measure of me but I thought I was Berlioz. I had absolutely no practicality or idea as to how I was going to achieve what I wanted, I just knew I was going to do it. When I left I still thought of myself as this romantic Berlioz figure but I was lucky to be getting commissions right from the start although I was only charging about twenty pounds. I remember one person paying me in cash from his wallet! Many of the people I knew well at college became successful very quickly including Graham Johnson who formed the Songmaker�s Almanac and I wrote four pieces specifically for them, including Playing with Words, Cocaine Lil and A Little Act upon the Blood". It was during the year after leaving college, that a friend suggested sending a score to the BBC New Music Panel. This proved to be a fateful suggestion for it brought the young composer into contact with Hans Keller, who was to become not only the first but also the most lasting influence on Bingham to this day. "I sent him a pile of scores and he wrote me this wonderful letter that I took complete umbrage at, saying that I had the same problem as Beethoven, too many ideas and that I needed to be more disciplined. I wrote back to him and so started our correspondence until one day I said if you are so clever why don�t you give me lessons to which he replied alright but you won�t like it. We used to meet in the old BBC club in Langham House and he would chain smoke and drink vodka whilst really looking at my scores in detail. I was so innocent that it never occurred to me that this famous teacher would usually charge a lot of money for lessons and he never mentioned it. I saw him for two or three years and he was wonderful, a real father figure to me. When we stopped seeing each other he wrote me a long letter saying that I was the only pupil he had never charged for lessons. I was just so naïve, but he got me some commissions including one for Peter Pears, which was wonderful. I just wish he were still alive, as I never had the opportunity to thank him. Unlike the teachers at the Academy he would never say you can�t do that. Instead he would ask what I thought of a piece and act as an analyst. I had this thing about spontaneity and not revising pieces and I always remember him asking me what made me think the spontaneous idea was the first one. I just couldn�t see what he was driving at. It was years later before I understood that Beethoven filled notebooks before he came up with his spontaneous idea for the opening of his fifth symphony". 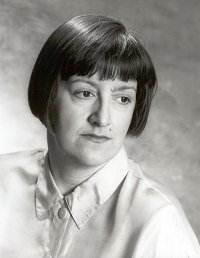 The commissions continued to come in and a steady flow of mainly chamber pieces were produced in response, one notable success being the BBC Young Composer of the Year award in 1977 for the harpsichord piece, A Fourth Universe, together with a work for harpsichord and soprano, The Divine Image. "I remember singing in the concert, I still have a tape of it in fact". In spite of these early successes it was not all plain sailing. "There was a time in my late twenties where I kind of lost hope for a while, my music had sunk into this turgid, awful rut and I just lost interest. I suppose what brought it all about was my opera about the life of Errol Flynn, which with the libretto and the music took two years to write. I spent a long time trying to put it on myself but the whole thing was disastrous and I ended up shelving it. It threw me into a very depressed state for two or three years but then a series of things happened. I met my future husband, joined the BBC Singers which gave me a salary, and I also had some therapy, which helped a lot. I was a lot more emotionally stable and got myself over the kind of writers block that I had, so things just took off again". The work that was to prove crucial in this reversal was Bingham�s first orchestral score, Chartres, inspired by the overwhelming impact of a visit to the great cathedral. In some ways it was a long time in coming, written without the aid of a commission and occupying over a year in its creation. "It�s the only big piece that was not written to commission. A huge work, thirty five minutes and of course although everyone said it was very interesting no one wanted to do it. I finished the score in 1987 but it was 1993 before the BBC Philharmonic took a flyer at it. By that time, as with Flynn, I had given up on it. It was Jane Glover who asked me if I had any chamber orchestra pieces suitable for the London Mozart Players, to which I replied no but I have got an orchestral piece! It was a huge turning point in my career. There was a big reaction to it and virtually the first week it was performed I got four other big commissions including another orchestral piece for the BBC. It was wonderful". The years since 1993 have seen a succession of major works, both orchestral and chamber, although there are still the ever-present choral pieces. Many of these works seem to be written with astonishing speed, indeed there are few contemporary composers as prolific with ten works written in 2001 alone (the composer modestly points out that some of these works are relatively short!). The success of Chartres opened the gates to some prestigious commissions including Beyond Redemption, the work commissioned by the BBC in the wake of the first performance of Chartres, The Temple at Karnak for the Bournemouth Symphony Orchestra which has since been toured extensively including a performance at the Vienna Musikverein and Otherworld, a large scale cantata for the Three Choirs Festival. There are also a good number of earlier works that have been "discovered" and taken up by artists some years after their composition. "It was quite a breakthrough when Mark Bebbington did my piano piece Chopin. It was years since I had heard it and although he was enthusing about it I was really quite sceptical. Yet it went down really well and two other pianists immediately played it straight away. Even with early works there is virtually nothing that I have withdrawn or revised. If you write a crap piece history will judge it and it will just disappear so I have tended to just let things stand". Brass bands have also been a source of inspiration, perhaps not surprisingly for a Yorkshire-born composer, with a succession of substantial works for the medium throughout the 1990s. "I was approached by Bram Gay of Novello�s to write a band piece in the late 1980s and came up with a piece called Brazil. I thought it was pretty lousy and unusually for me, withdrew it. I had made all the classic mistakes, it was bottom heavy and I just didn�t rate it but I immediately received two commissions on the back of it and wrote Four Minute Mile for Leyland Daf Band and The Stars above, the Earth below, for The Royal Northern College of Music Band. After that I thought that�s it, I am not doing anymore brass band music but immediately got the commission for Prague in 1995 and in spite of vowing once again that I was finished with bands wrote These are our Footsteps in 2000. The thing is it�s such hard work producing them but when you hear the way the bands play it is just so exciting". So what does the future hold? There are no shortage of works waiting for suitable commissions and one major ongoing project that is going to occupy much of the next year or so. "I�m keen to do a string quartet and having done a Piano Trio and String Trio would like to do all the standard chamber forms, piano quartet, piano quintet etc. At the moment I�m writing a piece for the cathedral at Bury St. Edmonds which is going to be a huge sacred music drama, a kind of church opera for performance in 2004 which is to celebrate all of the new building work which has been done there. It will involve all kinds of dance elements, the cathedral choir and solo singers and is based around a twelfth century ivory cross which was allegedly carved for the cathedral and depicts scenes from the gospels, with a strong element to do with tolerance as there was a lot of anti-Semitic feeling in Bury St. Edmunds at the time. It�s really exciting and right up my street". In the year that Judith Bingham celebrates her fiftieth birthday there seems to be no halting the flow of music or inspiration. One cannot help but feel that with the major successes of the last decade behind her, the new millennium is likely to bring yet greater anticipation from her expectant audiences.